When Mr Brian Simpson (European Coordinator for the Motorways of the Sea, MoS) and Mr José Anselmo (MoS Principal Advisor at the European Commission) got acquainted with the Midway Alignment of the Bothnian Corridor project and its partners in Umeå and Vaasa in September, they were delighted with the regional business partners’ know-how and commitment to the development of the Kvarken transport system. 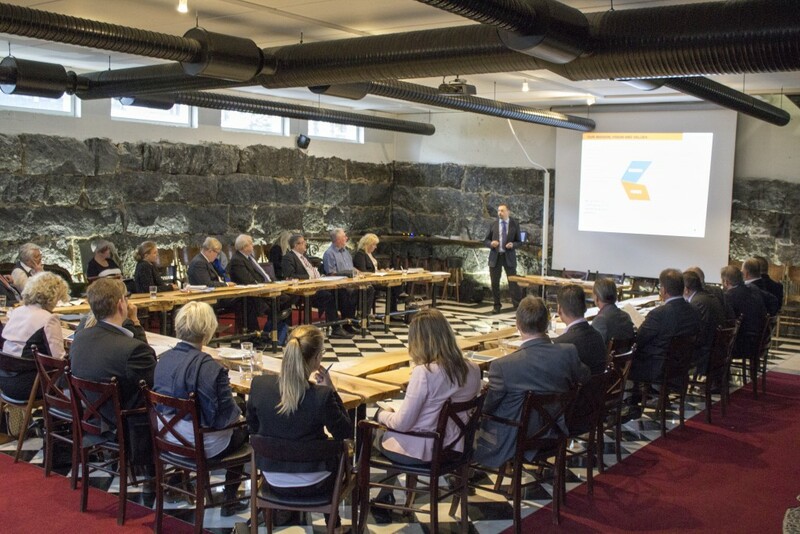 The innovation workshop organized in Vaasa included speeches from the representatives of the Finnish Transport Agency, Åbo Akademi University, ABB, Wärtsilä, Wega Advisors and UPC Center. Mr Simpson and Mr Anselmo were especially interested in Wärtsilä’s operations, presented to them by Mr Juha Kytölä and Mr Patrik Malka. Wärtsilä – the developer of energy and maritime technologies for land and sea use – operates, in practice, all over the world. The company pays special attention to the environmental friendliness of their solutions’ entire life cycle. – We want to be the most valued business partner for our customers, says Mr Kytölä. He tells that the company is searching for market growth particularly with their innovations regarding energy efficiency, gas technology and innovative energy solutions. Wärtsilä, a long-time developer of multi-fuel solutions, has recently been profiled as the expert in gas technology. For instance, the company masters all the functions in the value chain of liquefied natural gas (LNG). An excellent example of this is the LNG terminal being built in Tornio, which Wärtsilä will deliver to the customer on a turnkey principle. 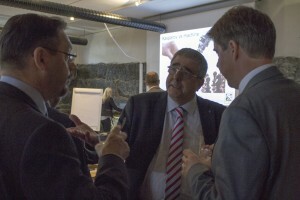 Mr Malka’s presentation clearly highlighted how the globally-functioning company also develops its operations in Vaasa. Wärtsilä’s participation in the Midway Alignment project as well as its initiative in determining the LNG terminal’s founding conditions reflect the company’s dedication and commitment to the region. Another excellent collaboration example is the energy laboratory under construction at Palosaari in Vaasa, funded by the University of Vaasa, the City of Vaasa, Wärtsilä and TEKES (the Finnish Funding Agency for Innovation). Wärtsilä provides the motors for the said internal combustion engine laboratory, and these motors can be utilized in future research and development projects. – The new laboratory enables better cooperation with the university and complements the operations in our existing diesel laboratory. It also gives the students the chance to get to know our motors already during their studies which, in turn, renders the students even more interesting recruits, Mr Malka says. The internal combustion engine laboratory, designed to be completed next year, constitutes the new energy laboratory’s first phase. In the future, the complex will be complemented with laboratories specializing in renewable energies and smart energy networks.